March 12, 2015 – Three seconds all it took for the attitude control motor of NASA’s Orion Launch Abort System (LAS) to prove that its material can survive not only the intense temperatures, pressures, noise and vibrations experienced during a launch emergency but also 40 percent beyond. The LAS is being designed to bring a crew to safety should there be a problem in the launch pad or during ascent. “We tested over the maximum expected environments to assure the motor could withstand an abort emergency,” explained LAS chief engineer Wayne Walters. On March 4, Orbital ATK, in collaboration with NASA and Lockheed Martin, completed its latest test of one of the most complex solid rocket systems ever built for the LAS. Built by Orbital ATK, the attitude control motor consists of a solid propellant gas generator, with eight proportional valves equally spaced around the outside of the three-foot diameter motor. Together, the valves can exert up to 7,000 pounds of steering force to the vehicle in any direction upon command from the Orion – the spacecraft that will one-day take humans to an asteroid and eventually Mars. Despite being one of the last in line of a series, this test was the first of its kind. Engineers at Orbital ATK’s facility in Elkton, Maryland, tested one of the valves of the attitude control motor during the test, which would be used to keep the LAS, with the crew module, on a controlled flight path if it needed to jettison and steer away from the launch vehicle in an emergency. It also reorients the module for parachute deployment and landing. 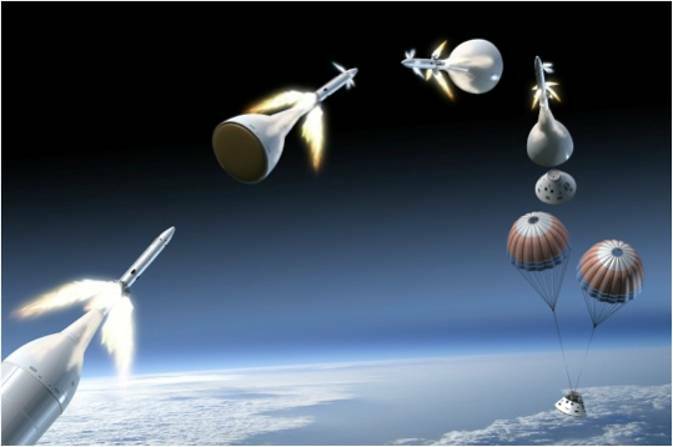 “Although we hope the system will never be needed, it is comforting to know we are designing a system that ensures our astronauts are safe when they go on missions beyond low-Earth orbit,” said LAS flight dynamics lead John Davidson. The LAS is managed out of Langley in collaboration with NASA’s Marshall Space Flight Center in Alabama and NASA’s primary contractor for the Orion crew module, Lockheed Martin of Littleton, Colorado.